My experience therefore was very short but that was the first time I entered public life, and, as you know, first impression lasts the longest. My first impression of public life was nurtured by a burning ambition. I was not satisfied with being a barrio school teacher. By the time vacation was over, I had saved a good part of my salary which I had been turning over to my mother – about P 50.00. I took a boat bound for Manila where since then I have lived longer than in my own province. In the city I grappled with untold difficulties. It is where I earned the reputation of being a self-made man. I worked my way through college from high school in Manila to the University of the Philippines. It is a regrettable fact that throughout my four-year law course I was not able to buy even one class textbook. That didn’t mean I had no money or that I lagged behind. I was able to pull through and finished my course without any hitch. I love to remember my humble beginnings. Many students who have begun in a very modest way as I did are often discouraged in the middle of the road. If I succeeded after forty five years of struggle to reach the first magistracy of this land, it is because of two qualities or factors : firm determination and burning ambition. I still have another ambition, and that is to retire someday from this palace to another barrio school and teach in it. I expect to be able to realize that ambition. I have already prepared my retirement. I have built a small house in Novaliches where I am trying to learn how to be a good farmer. I am now an amateur farmer but I will try to make good and see if during the days of my retirement I shall not be able to uplift the adults who have never been to school in all their lives. There are many of them still. That is going to be the concluding and culminating chapter of my ambition as a citizen of this country. It is a source of pride to me that in my public service I was able to improve the salaries and conditions of the public school teachers by raising your pay, fixing its minimum and making your vacation leave commutable. And we are not going to stop there. Personally, I will not because I know that you are in the frontline of the great national brigade. There are messengers in the government, even laborers who earn more today than the barrio school teachers and yet the school teachers has a great responsibilty as the top officials of the national government. You mould the minds of our youth in the barrios and in the municipalities. You are the first light thay they see in their community. You are the first light thay they see in their community. In the brigade where we want to bring the people closer to the government and make them understand the function of the government and the extent of their duties and privileges, it is you who first give the light and explain the rights and responsibilities of the citizen. 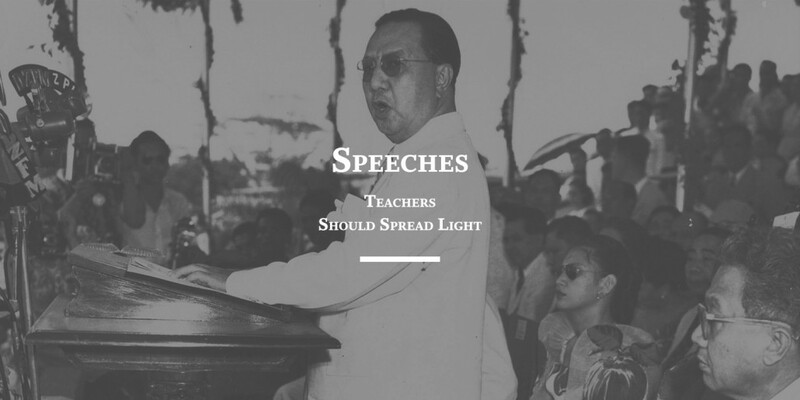 That is why the great mass of teachers in the Philippines constitute the frontline in this brigade of national understanding that must be promoted, exploited, and accelerated in order to enlighten and quicken the people in a counterpart campaign against those who are trying to sow in our soil the seeds of dangereous thoeries of life which we find most inimical to our liberty and freedom. Your campaign of furthering your community life or, as you call it, community center schools, must be encouraged. It is in line with our policy of constituting other agencies in the outlying communities to enable us to carry out our national policies with a complete system of communications and direct contact with the people, such as the barangay, the community assembly, the boy scounts and girl scouts, and civic, and charitable associations of every kind sponsored and assisted by the national government. But all these should be coordinated. They should be accelerated. Your life in each community is one of leadership. We should overcome the monotony in the barrios or in isolated political entities of this country by injecting new enthusiasm and giving them a new outlook. We should not be content with being chosen as leaders in athletics, in literary programs or in beauty contests. You must do more than that to arouse intellectual curiosity and sharpen the intelligence of our peole and make them enthusiastic in their association with you as you promote the general welfare of the community. You say you are now 85,000 teachers. Over two decades ago you were only 25,000. Imagine the enormous number that is representing us as an individual units in each community. If we could make the whole country hum with your activities, your inspiration, your courage, how beneficial would that be to all of us. I remember the days when there are no many schools in the barrios and when we used to hear people almost in every home reading and singing the Pasion. Now something like that should be evolved to attract people and bolster their morale and their spirit, and break the monotony in each community. It may take the form of a community or cooperative store, a cooperative irrigation system, cooperative vegetable production, or a cooperative poultry association. It may vary to folk dances, songs and serenades at night. I used to take part in such serenades, and I can tell you that it exerted some influenc in my life. At night when you hear a serenade, especially when you are alone and lonesome, when you hear a lovesong, you feel something uplifting and you wake up in the morning almost repeating, humming the song you heard the night before. You must put up something like that to arouse the interest and enthusiasm of the community and the people. Text books will not be enough. Songs that are of the same pattern all over the Philippines will not be enough, either. You must invent something new – new tunes, new songs – to interest people. Such innovations will make life more pleasant. As leaders in each community, you should spread light. Go beyond the present horizon. See if you can dig up something which will interest the people and make them follow you as their confirmed leaders. Eighty five thousand teachers constitute a strong force in the frontline for the civic and social welfare of the people. I am glad you found time to come to Manila before the opening of the next regular school session. The barrio school teacher should be encouraged to come to Manila if only to broaden his outlook, his mental horizon. Teachers should not be made to depend only on what they read. They should see how people fight like tigers and lions in their public debates so that they can impart their impression to their pupils and neighbors when they go back to their respective districts. Such things are necessary today. The world is getting monotonous. We are not concerned today only with the world struggle for supremacy. We are forgetting many of the little things that make human life worth-while and interesting. Let us give incentive to our population in the outlying districts and infuse more enthusiasm into them so that they may be better prepared to contribute their share in the growth and development of their country, the result of which will be seen in the next two or three years. Many people do not realize the great strides we have made in rebuilding the Philippines and enhancing its name and fame which we now enjoy. Many people have remained ignorant of what is going on in our country. Some of them believe that we are still living in those days when the Spaniards just ordered us about and we obeyed them blindly. You had better read your history, read the news about the world events and compare them with the march of events in your country. Tell all and sundry that when the Spaniards conquered us we were less than three million; that when the United States landed on our shores we were only six million. Tell them that when we established the Commonwealth Government we were not more than 16 million, and that now we are 20 million people. Tell them how poor we were then and how dark was our region and show them how advantageous our position is today strategically in commerce, in civilization, in world affairs; how the Philippines has been elevated to the extent of presiding over the agencies of the United Nations. Tell them how the Philippines is now faring among the powers of the world. We don’t have to posses a big standing army like Russia or the United States in order to be heard in the high councils of the world. Tell them that we have assimilated all the types of culture that have been brought to this country – from Europe, from America, from China, Japan, India and Malaya, all of which came here in successive waves, leaving behind sediments of their influence, their culture, their religion, and their civilization as well as their outlook on national life. Describe to them how we have evolved into a new nation, not the old nation of which Rizal dreamt or the nation that Lakandula conceived, but far more progressive and distinguished and enterprising. Not only have been able to keep pace with the world but today we stand as the most civilized nation in this part of the earth. Let us arouse the interest of our people. Let us awaken their enthusiasm about the epic of our nation and make them proud of their country, the country that God has given us to cherish and develop to the utmost. You have a great task before you. I wish I have the privilege of being reborn so that I might feel anew the tremendous responsibility that faces you and cooperate with you in this new urge to work for the survival of our nation while other nations are being threatened with annihilation. Let me sound a word of warning. If we do not look out, if we do not prepare our people to defend our country to the limit, we, too, may have to follow those nations which one by one have fallen because of the aggressiveness of Soviet proganda. It is necessary that in each community you inculcate on our people the necessity of pulling together and defending our country against external aggression. Today, as you already know, many parts of our land are being harassed by unprincipled, unpatriotic, dangerous elements who are not only trying to subvert this government but are killing hundreds of innocent children, aged people and even hospital patients in their mad desire to sow discord and confusion and deliver their own people and country to a foreign and ruthless power. My friends, you must cooperate with the national government in this fight. The forces of our country are not enough. Our means of propaganda are not enough. The government cannot satisfy all the needs of the communities which have never received any benefits from the government before. Something must be done to supplement this deficiency, and that something is your effort, your patriotic interest, your enlightened leadership in your respective communities. We are a young nation but we are old in experience. We are weak physically but we are strong in spirit. We have a great responsibility in this part of the world. Let us maintain that prestige by continued exertion of effort ever to promote the social welfare and elevate our citizenry so that we may be able to vie with the other nations of the world.